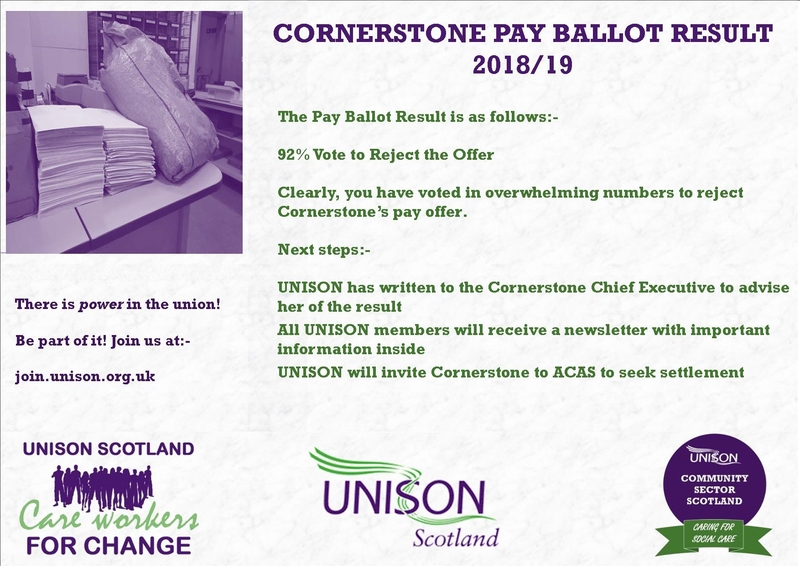 UNISON members working at Scottish care charity, Cornerstone, have voted by a massive 92% to reject their employer’s pay offer in a consultative ballot. These staff, mainly women, provide vital care and support to people with learning disabilities, physical disabilities, autism and dementia across Scotland. UNISON, Scotland’s largest union, says it has never before seen such strength of feeling among its members in the charity sector. It is calling on Cornerstone to get back around the table and negotiate a fair deal for the carers providing vital services to the most vulnerable people in our communities. Deborah Clarke, UNISON regional organiser, said: “Today’s ballot result is an amazing show of strength by a predominantly female workforce and shows the tide is turning. Employers can no longer expect to get cheap labour on the backs of low-paid women. UNISON recently carried out a staff survey among its members at Cornerstone, which is due to be published next week, which revealed a massive 91% don’t believe they are being paid fairly for the roles they carry out. Mike Kirby, UNISON’s Scottish Secretary, said: “Caring roles, which are carried out predominantly by women, remain chronically undervalued. Today’s ballot result shows that carers know they are worth more and are prepared to fight for the pay they deserve. Previous Post:Just what is going on at Cornerstone?